Rainbow Spirit Sweater by JayBirdFinnigan! - Super Inky! Hello my friends! Today I want to share a wonderful sweater with you! This beautiful white hoodie sweater is from a pattern by JayBirdFinnigan! 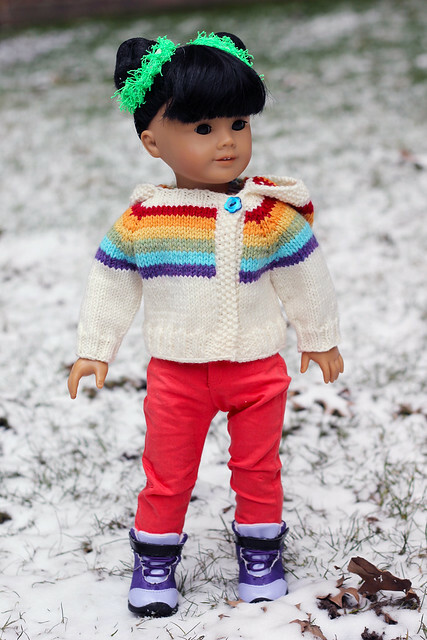 The sweater features an awesome rainbow pattern that carries over across the body of the sweater, the sleeves, and a hood. It closes with a button at the collar. The pattern also includes variations for making the sweater Hogwarts style- with instructions for different Hogwarts houses. There are also instructions for making the sweater with a cute heart pocket. Of course, you can make the sweater in any colors you like as well! 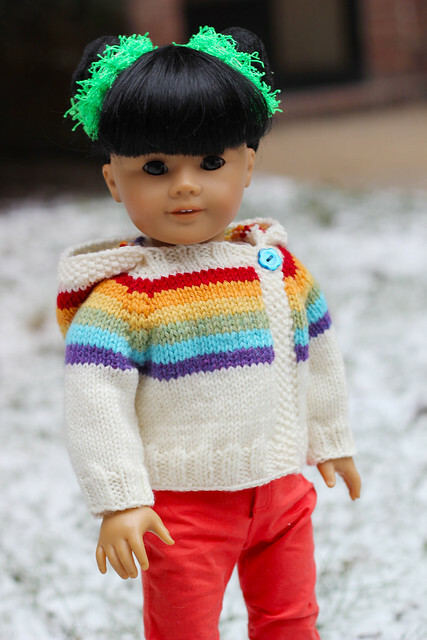 All in all, JayBirdFinnigan's pattern makes an awesome sweater! You can check out JayBirdFinnigan patterns on etsy at this link or on ravelry at this link. The designer also has an awesome Kangaroo Campfire Hoodie- if you are on Ravelry, you can also download free instructions to make a Team Canada variation for the Kangaroo Campfire Hoodie. When you purchase the pattern, be sure to mention me, Super Inky, in the comments on your etsy transaction! Thanks for reading!! 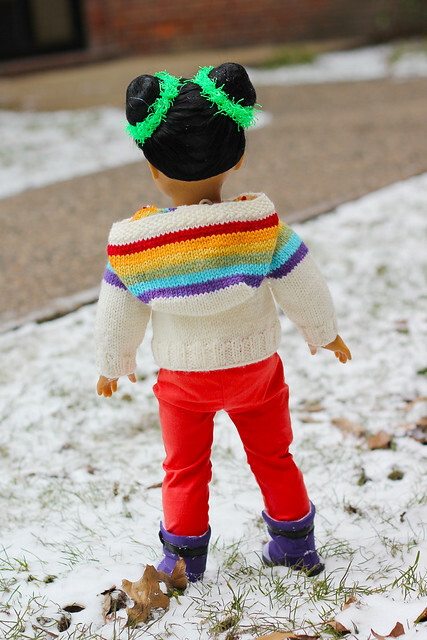 In this entry I'm wearing: Rainbow Spirit Sweater by JayBirdFinnigan, orange pants and purple boots by American Girl. Thanks Randomfish! I love it too! I love your new sweater, Inky! I'm very jealous that you get to play in the snow. We never get snow where I live. Thank you! I love my new sweater too. I don't really get to play in the snow- as you can see in the photo, the grass peeks out from the snow so it's now very deep! Oh, Inky, your new jumper is wonderful! It looks perfectly cosy for a snowy day. Do you still have snow on the ground where you live? All our snow has melted. I'm happy to see the spring coming, but I'll miss the snow too. How about you? Hi Audra! My new sweater is super cozy and wonderful! I think you should get one too, okay? I don't have any snow on the ground anymore. Our snow is all melted and I'm really excited for spring to arrive! Oh Inkie! I wish she was selling the actual sweater and not just a pattern! NONE of us know how to knit! Whaaaaa! You should ask someone to knit it for you!! 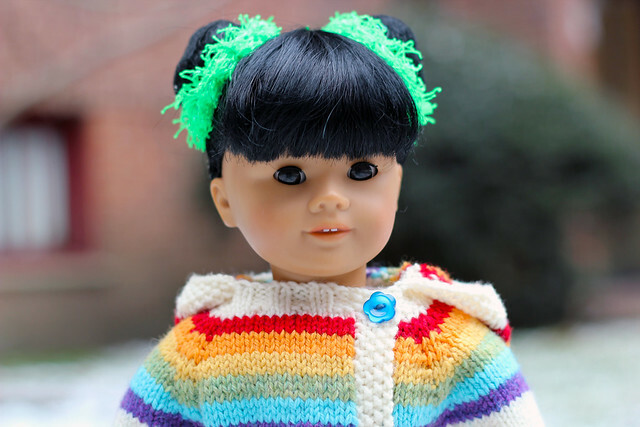 I know Royal Doll Boutique sometimes sells custom knit items! I'm with Dolly Dorm Diaries. Knitting is too hard for us little vinyl dolls!!! It seems the prestigious Liebster Award is pretty popular in your area, for I have nominated you as well! This sweater is adorable and it looks so cozy on you, Inky! The colors are so pretty and suit you so well. I'm jealous!